Isn't it amazing how kids' brains process things? I love it. Your children have the sweetest smiles. Love the pictures! 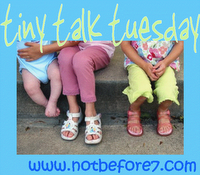 Ok I just love Tiny Talk Tuesday! BTW are you and Mary related? The girls smiles look so similar! What a cute answering machine you have!! I am laughing so hard!!!! McKenna cracked me up with the answering machine comment. Oh, McKenna, you're too funny!